MyTriniGrocery Chief Pholourie Mix :: Enjoy Chief Pholourie Mix! 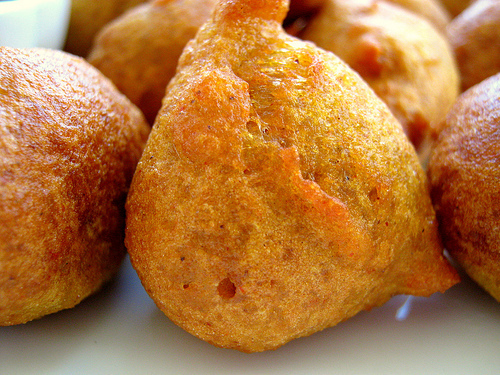 Pholourie is basically a batter, fried in oil by the spoonfuls and served with a sauce or chutney of some kind. Usually the popular sauces are tamarind chutney dip, shadon beni chutney, mango chutney or any other chutney for that fact. Pholourie is sold everywhere (at palours, the market, and busy street corners); it is popular at football matches, family day celebration, harvests, and even parties and fetes. Wherever there are people enjoying themselves, look out for Pholourie. It is perhaps more popular than doubles because of its versatility. This finger food is delicious and loved by all. Are you in the mood for some 'pholourie'? Now you no longer have to make it from scratch everytime! Use one pack of Chief Pholourie Mix and slowly add one cup water while mixing, to form a smooth paste. Cook immediately if needed. Pour enough oil, in a frying pan, heat until medium hot. Drop pholourie Mix by teaspoonfuls into heated oil. Pholourie should begin to try immediately and will rise to surface of oil and float, turn over if necessary and allow to try until golden. Remove and place or absorbent paper. chief pholourie mix hot pholourie pholourie pholourie and chutney pholourie and tamarind sauce. Great product! Great taste! Fast shipping. Chief brand pholourie mix is really good, each back makes about 30-40. It's is perfect. Click the button below to add the Chief Pholourie Mix to your wish list.